The “Universe Survival Arc” is well under way as we start our look at the near-enough sequel series to Dragon Ball Z, Dragon Ball Super, currently available to stream for free at Daisuki.net. We’ve had slightly re-worked versions of the Battle of Gods and Resurrection F films, then a tournament between “our” universe, Universe 7, and nearby Universe 6, which had a lot of comedy in it, as well as introducing the idea of multiple universes to the franchise. We then got the return of Future Trunks and an evil copy of Goku known as Goku Black, which was more like a traditional Z story arc, with more dramatic stakes and large battles. Now we’re here, and to give a quick, final sum-up of the story so far, Zeno, the “Omni-King” who’s God of every Universe (and a future version of himself from another, now destroyed timeline… don’t ask) have felt that the eight weakest universes of the twelve should be wiped clean from existence, but have been accidentally convinced by Goku to hold a big tournament known as “The Tournament of Power”, with the winning universe getting to survive, while the other seven are destroyed, plus the strongest fighter will also receive a wish on the planet-sized Super Dragon Balls. The tournament itself isn’t actually a tournament, each universe has 10 fighters, and all 80 combatants will fight each other at the same time in a battle royal, elimination occurring if they are thrown from the huge fighting arena. Sound crazy? Yep. If there is one thing Dragon Ball Super likes to do, it’s play around with the previously small world of Dragon Ball and add to it. Right, now let’s look at this batch of episodes! Episode 82 starts in the aftermath of an “exhibition match” between Universes 7 and 9, which has seen Goku victorious in the last of the three matches, winning it for Universe 7. 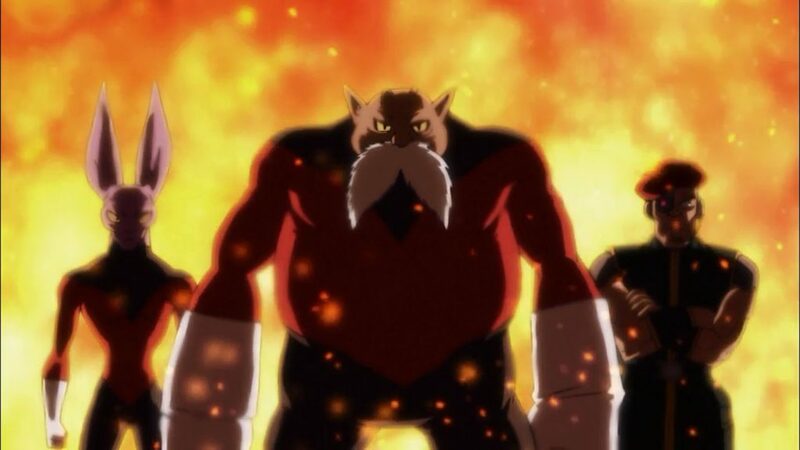 Toppo, a overly proud superhero-like character from Universe 11 has jumped in front of Goku and challenged him, declaring that Goku is evil for causing this tournament in the first place. This is sort of true, Goku didn’t know Zeno was going to destroy eight universes before asking for the tournament and that this might save one, and he was also expressly warned not to “poke the bear” and talk to Zeno about the tournament in the first place by Beerus. It worked out well in that now one universe has a chance to live, but I guess Toppo still saw it as Goku’s fault. Goku looks like he’s about to win before Toppo declares he hasn’t used his best yet, which Goku also claims to be holding back (classic Dragon Ball!) but they’re stopped by the entirely untrustworthy Grand Priest. Toppo, also in classic Dragon Ball fashion, tells Goku that he isn’t the strongest person in Universe 11; a fellow member of the “Pride Troopers” called Jiren is far stronger. Goku is excited, and the Priest declares that the tournament will take place in a few days and they should get their teams ready. Episode 84 sees Goku and Gohan recruit Krillin and Android 18 to the team, complete with an exhibition match between Goku and his old friend, which teaches Goku that the upcoming battle royal will be every man for themselves, and so he can’t expect to fight his chosen opponent one-on- one. A rare Goku fighting-related miscalculation, as opposed to a common Goku everything else miscalculation. 85 focuses on Goku checking in on Buu before scenes from the other universe’s Supreme Kais having a meeting that doesn’t really go anywhere, and then a scene with Toppo and his Pride Troopers in action. Finally, Episodes 86 and 87 focus on the first-time meeting between Android 17 and Goku, the former living in a secluded island fighting off poachers and saving the local wildlife… and then the two warriors have to fight off alien poachers in their flying saucer… Yep. Really. 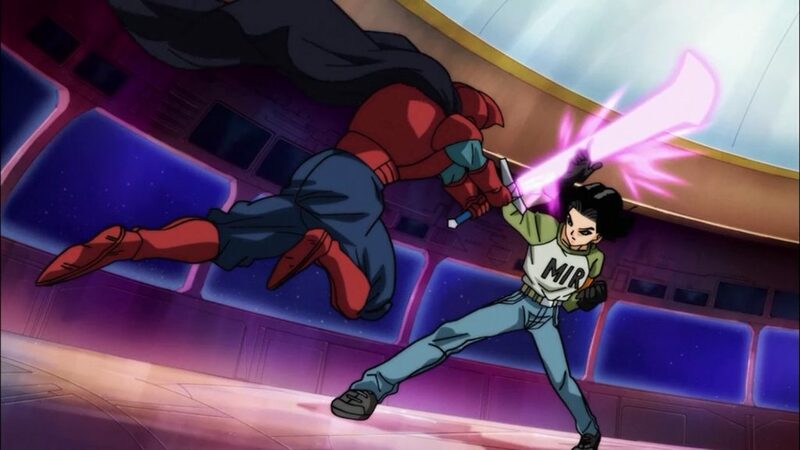 A few criticisms have arisen from the last two episodes, namely Android 17 fighting on a par with Super Saiyan Blue Goku, a form said to be comparable to the Gods themselves, which is a fair comment, but after Golden Freeza did the same thing, I think it’s safe to say that the old “Power Level” debates and spreadsheets have been tossed out the window in favour of a mix of fighters beyond just Goku and Vegeta. Given how one-sided and Goku-based Dragon Ball GT was, I’m okay with this. The second one, and this is the one that annoyed me, suggests that Android 17 isn’t convinced to join the cause, not even when he finds out the whole universe could be wiped out if they lose “Oh well, if we all die at once it won’t be so bad”… I mean, from a “there won’t be anyone to grieve” sort of way that’s true, but… you know… may as well try and stop it…. Anyway, then he is convinced to join when he hears of the Super Dragon Ball wish because, sigh, he really wants a big boat to go sailing around the world with his family. Huh?! For starters, just save up your money and buy one. Or ask for one from super-mega rich Bulma as his fee for entering… or use the Earth Dragon Balls to wish for one. Plus, he’s spent two episodes talking about the “last Minotaurus” that he is protecting, why not wish for the species to become un-extinct instead? Selfish git! It’s a shame because otherwise I really enjoyed this revisit to Android 17 and the first meeting between him and Goku. Also this features Goku admitting he’s not really a hero, and that he just likes fighting strong guys and the Earth keeps getting saved as an aftereffect, although he also admits that seeing innocent people being killed makes him angry. The quote about not being a hero is actually almost a word-for-word quote for a Toriyama interview from the lead-up to the Resurrection F movie, so it was an interesting moment to see it expressly stated by Goku himself. Top stuff. Episode 86 is spectacularly animated, particularly the fight between 17 and Goku. In fact, I’ll say it now: with this arc the animation has switched to a different team and method than the previous 70-odd episodes, and it shows in a positive light. The fight scenes in the Exhibition matches in the previous episodes were top-notch, and the fights here have been great too. Very fluid and the backgrounds have been nicely detailed, even if Beerus often comes off as looking more… oddly shaped. Another little aggravating point in this recruitment mini-arc is that the intro, ad-break eye-catches and the ending all tell us who gets recruited, so the slow reveal seems a bit pointless. Plus why did Goku and Gohan think of Master Roshi as an option and yet still haven’t thought about Tien / Tenshinhan? They were impressed with Krillin’s new version of the Solar Flare, yet didn’t think about the man who invented the move in the first place! I only hope this is corrected in the upcoming episode that deals with Tien’s recruitment.